I had great hopes at the start of this book that we'd get a meaty but approachable history of the development of mathematics. When describing the origins of number, arithmetic and mathematical processes the opening section is pitched well, but things go downhill when we get to detailed mathematical exposition. 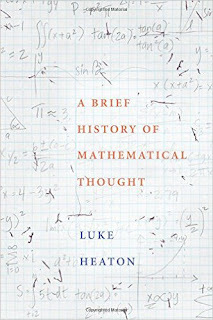 The problem may be that Luke Heaton is a plant scientist, which may have prepared him better for using maths than for explaining it. If we take, for instance, his explanation of the demonstration that the square root of two is irrational, I was lost after about two lines. 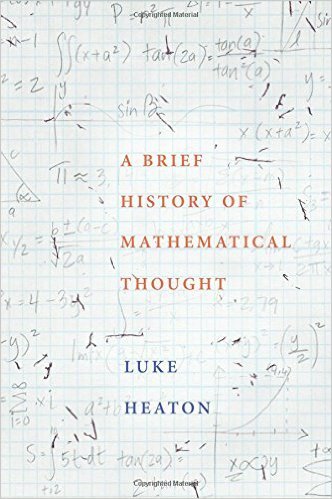 As soon as Heaton gets into mathematical detail, his fluency and readability are lost. There's a central chunk of the book where the mathematical content seems too heavy for the way the contextual text is written. We then get back onto more effective ground when dealing with logic and Turing's work, before diving back into rather more impenetrable territory. One slight concern is that, in talking about Turing, Heaton presents the largely discredited idea that Turing committed suicide by eating a poisoned apple, laying the blame for this on his arrest and 'treatment' for homosexuality, a narrative that doesn't stand up (it's a shame the author didn't have a chance to read The Turing Guide). I suspect this is a one-off and much of the mathematical history is fine. I didn't realise until I'd finished it that it has an interesting publishing history. It was initially part of the same Robinson published series as my A Brief History of Infinity, but this is a US hardback edition, just brought out by OUP. This was, then, a curate's egg book for me. I really enjoyed it when it was dealing with history and philosophy of maths, but found the technical explanations, even of mathematics I understand perfectly well, hard to follow.